Make Your Own Elegant Decorated Easter Eggs Today! We have shared lots of super cute Easter craft ideas for kids over these past two weeks from the ever so popular candy huggers to the personalized Easter baskets and decorated animal eggs. So today we’re switching it up. 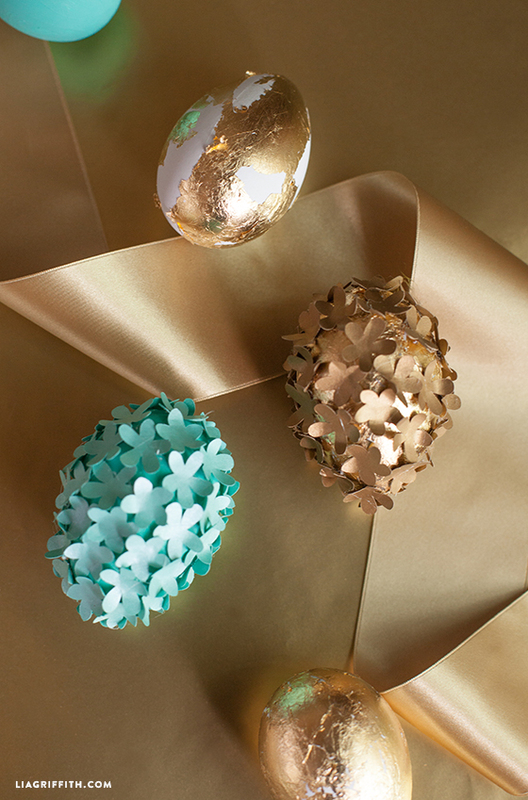 We’re going all grown up and glamorous with these elegant Easter eggs using tiny paper flowers, paint and gold foil. This bright teal and gold color palette is a favorite with us at the moment. It goes well with the Easter Brunch kit we shared last week. 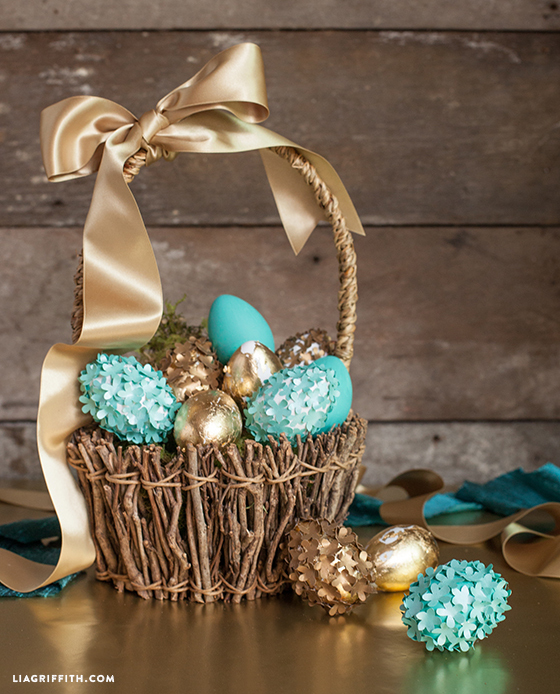 Display these eggs in an elegant bowl or a twiggy basket as your table centerpiece or have them dotted amongst real wrapped chocolate eggs to pass around after dinner. I love your eggs, was wondering where you got the basket. did you make it? I work with wood. I picked this up at the craft store. . . though I wish we had made it. If you do make baskets I would love to see them! 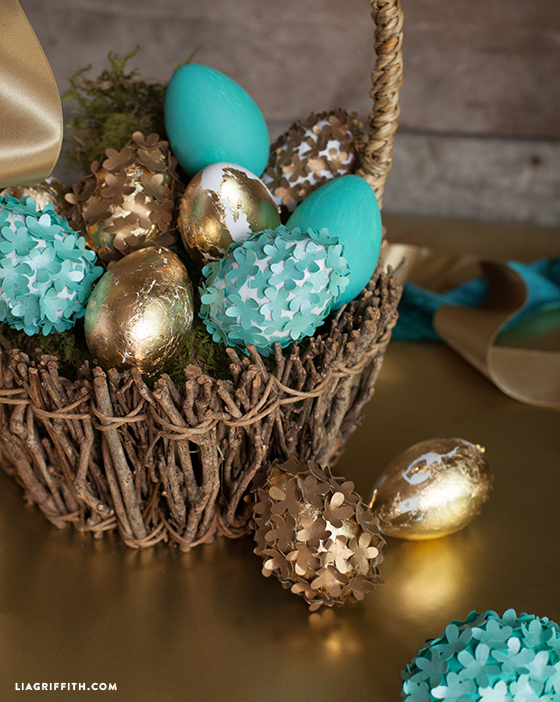 I must say I love the gold ribbon and the golden eggs. I too, would like to know where you purchased the ribbon? Thank you so much!! One of my favorite projects:-) I feel like I say that all the time, I am just having too much fun;-) I have had that ribbon for years, I don’t remember where I got it, I have a whole collection of ribbons. Elegant indeed Lia. Except that the flowery eggs put me in mind of those all-over-flowers swimming caps you used to be able to get! It does and I like that vintage look. Haha. What do you use to stick the little flowers onto the eggs? Just a little craft glue or low temp hot glue. These eggs are so pretty… Just beautiful! Must try these. Thanks for all of your pretty holiday suggestions! We love Easter! Can you tell? Another beauty, these colors work amazingly well together. As you say very grown up! You are so talented and sweet. Thanks for sharing! You are so welcome Linda! Such fun…I enjoy your Teal and gold. Nice ribbon…where did you get it …Paris…lol. Thank you 🙂 if daily inspiration.